Whether you go with something classic, like bacon and leek, or more unusual, like roasted brussels sprouts, quiche is a great way to make a meal from leftovers and get creative with what you find at the farmers’ market. For a 9-inch quiche made in a pie plate, you’ll want about 2 cups of prepped vegetables or meat for your filling. Ingredients for your filling should almost always be pre-cooked. (The exceptions here are herbs and cured meats, like ham, that you would eat right from the fridge.) This step makes sure these ingredients are cooked properly (no one wants raw bacon in their quiche!) and removes excess moisture from ingredients like mushrooms that could make your custard less creamy. 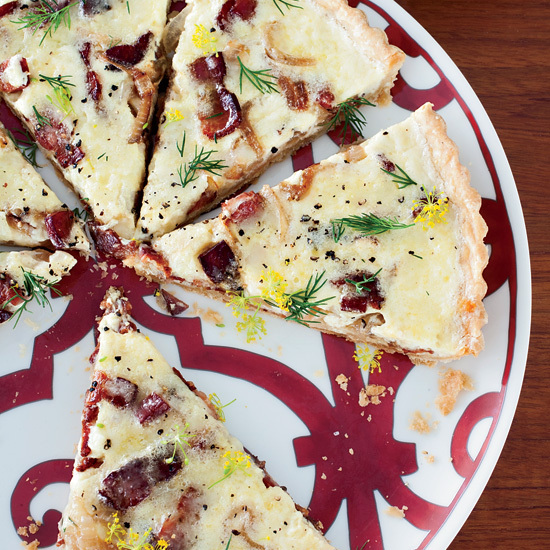 Cheese adds extra richness, depth and saltiness to quiche. Plus, it can be used as a layer between the crust and the filling to be extra sure the crust stays crisp. Melty, shreddable cheeses, like cheddar and Gruyère, have the best texture, but you could always add a bit of Parmigiano-Reggiano or pecorino cheese for extra punch. Goat cheese is another option, which is best served on top so it forms a tangy crust. For a 9-inch quiche in a pie plate, you generally want to use 3 large eggs and 1 to 1 1/2 cups of dairy. For the lightest quiche, use whole milk (do not even bother with anything lower fat than this). Deeper quiches, like Thomas Keller’s over-the-top one, require more liquid and at least one more egg.